Quaker's new Oatmeal Breakfast Squares nearly put me to sleep. The box gets you excited. It's an attractive, enticing product. The picture makes it look like the crumble topping of a cobbler with lines of decorative icing. They're promoted as moist and chewy oatmeal squares with "all the nutrition of a bowl of instant oatmeal". Unfortunately, the moment you bite down, your taste buds take a snooze. I tried two varieties. The Baked Apple variety, if scored on its own, would have merited a four out of seven on the golden egg scale. There's nothing special about it, but the flavor of apple has a comforting aspect. It's not bad and it's not great. The other variety I sampled was Brown Sugar Cinnamon. This was one of the worst products in the breakfast bar category that I've ever tasted. If you made it in your kitchen, you'd throw the batch away and start again. I can best describe it as a doughy clump with very little flavor. What flavor it does have tasted more like meat than pastry (let alone oatmeal). This variety, scored alone, would get a goose egg. Quaker has given us so many fantastic oatmeal products. It's sad to see this promising experiment fail. I suppose if taking great food and clumping them into package-size squares always worked, we could all have Filet Mignon bars for lunch. Maybe someday. But for now, I'll take my steak on a plate and my oatmeal in a bowl. A third variety, Oatmeal Raisin, was not tested for this review. The $3.95 price if for a 6-count box of 2.1 ounce squares. 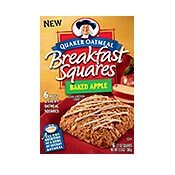 What do you think of Quaker Oatmeal Breakfast Squares? I only like the Raspberry Streusel to go bars. I am not and have never been fond of cinnamon,raisin, brown sugar, maple etc. The Rapberry streusel ones were very good but of course they are no longer available in my area. I don't know if they are still made because I can never find them online to buy. It figures that once I finally find something I can eat in the breakfast bar category that it's no longer available. My daughter and 5 grandkids also like the raspberry. The same thing happened with the instant cereal. I loved the berry one and now that's not available. I have been eating the apple cinnamon one but I really don't like it. I just figured its the best flavor that I could handle. I loves this bar! it is simply amazing. I eat mine heated, they are much better heated; but they are VERY good non heated as well. I too agree, I cannot believe that there are so many negative reactions to this product. I googled 'quaker oatmeal breakfast bars' looking to ship a large amount of them to my home and saw this negative review as a result of the query. I have a bar every morning. I find that they fill me up in a very healthful way to start my day and unlike other health bars they actual taste like they are made from real ingredients. I especially like the oatmeal raisen. They used to sell a raspberry struedel flavor which was quite good as well. I agree with scarlett, this breakfast bar is great and I would just love to have the recipe. Isn't it strange that there are so many different opinions? I guess that is what makes us who we are, otherwise we would be like robots programed to like or not to like. But I do find this bar very tasty and enjoyable. To each his own. I cannot believe there are so many negative remarks for this product. I LOVE LOVE LOVE them all. They are very filling and taste so good. I am on weight watchers and have one every morning so good with my cup of coffee and so high in fiber, which we all need. I have lost 25lb. I have about 4 boxes on hand at present and am so happy it works so well for me. I look forward to my first cup of coffee with my " Oatmeal to Go" bar in the morning. I will certainly purchase more when I run out of them. I found this dry and I kept chewing and chewing and chewing and chewing and had to force myself to swallow only because I was with people. In my opinion - just awful. To me this is the type of thing they would have stored in the bottom of a ship to pull out in an emergency to keep people alive just before they resorted to cannibalism. Maybe. They are so good. I don't know how anyone could give them a bad score. They are filling too. My children love these and they are healthy! Its a little pricy but what isnt these days? Maybe you should give these another try, Mr. Breakfast. I tried one during a flight and was immediately addicted. Great flavor (cinnamon apple) and great texture. This reviewer is full of crap. He wouldn't be though if he actually ate these wonderful, fiber-packed bars. I had the cinnamon apple on a couple of flights. I have to disagree. This is THE best breakfast on the go! I would eat this only out of desperation. Just now I was starving, and I ate this thing and it just tastes like a weird synthetic version of the flavors described on the label. I should have eaten my shoe. At least I know what its made of. Loved the squares,.....hmmmmm simmilar recipe around anyone? I would love that even more. (Personal use only) Thanks!!!! Why did they quit making them? They're a lot more filling than most breakfast bars, more healthy than Pop-tarts. Heating them up really does improve things - I don't know why that isn't a more prominent part of the instructions. Heat up for 10 seconds and they are chewy and awesome! I was surprised to see your rating. They are good and filling. Warm them up for 15 seconds and they become incredible. 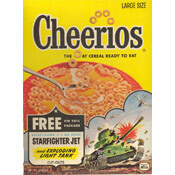 It's all I eat for breakfast now! I have tried the Brown Sugar Cinnamon variety of the Quaker Breakfast Squares. I have to admit I was pretty disappointed with the flavor and texture. I thought they could have had a little more brown sugar flavor packed in there somewhere. Also, they could have been a little softer and somewhat less chewy. It certainly wasn't the worst breakfast bar I've ever had, but now that they have express oatmeal cups that you can eat on the run, why not just have the real thing? Overall, it is an okay product.